Fair Hemp Custom Wristbands are the ideal solution for unique promo items with minimal impact on the environment. Full color embroidery is included in the price as are a number of packaging options to maximize your message or meet your requirements for resale. We specialize in the most environmentally sound and socially responsible options available. Production Lead Time is 8-12 weeks. Rush Delivery Available. Custom colors are available as is custom packaging (larger minimums apply). 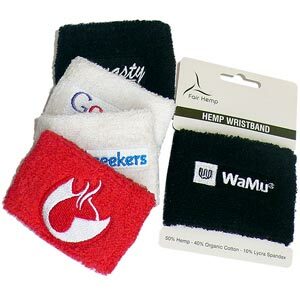 Fair Hemp wristbands are the stylish yet responsible choice for the environmentally conscious promotional item. Replacing 1000 pairs of traditional cotton wristbands with Fair Hemp's hemp/organic cotton version saves over 14,000 gallons of fresh water that would be used in cotton production and keeps over 23 pounds of chemicals and pesticides out of the environment. Even the single packaging option is on 100% PCW recycled cardstock with soy inks.